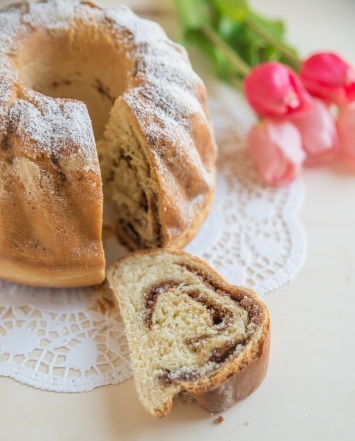 This is a simple, easy to make and yummy sour cream coffee cake recipe. It has sweet and crunchy streusel layers between the soft layers of cake. Most streusel layers combine cinnamon and walnuts with a bit of sugar. This recipe has an extra secret ingredient in the streusel – cocoa. This recipe is bound to be a hit with family and friends. Combine the dry cake ingredients and mix until well blended. Cream together the butter and sugar until light and fluffy. Add the eggs and sour cream, then add the dry ingredient mixture. Place about 1/3 of the cake mix in a greased tube or bundt pan. Layer 1/2 of the streusel over the cake batter. Add another layer of each and end with a layer of cake batter. Bake for 50-60 minutes or until a toothpick inserted into the center of the cake comes out clean. To lower the fat content, replace 1 cup of the sour cream with a cup of plain yogurt. Sprinkle powdered sugar on the top of the cake by sifting it through a strainer while holding it over the cake. Coffee cakes really are easy cake recipes to make from scratch. Even if you don’t consider yourself a real baker, you can easily make this cake recipe for family and friends. The cocoa in this recipe adds another tasty flavor element and really zips up the flavor. It is one of the best cake recipes I have. 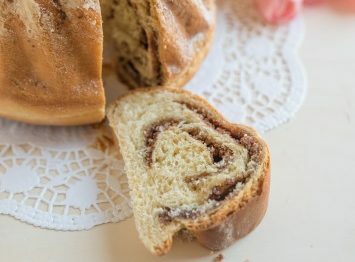 If you are going to indulge in cake, a coffee cake recipe like this one is one of the best to eat. It is simple, no high sugar icing, and has nuts for added nutrition. Like this recipe? We’d love you to Pin it to Pinterest, Tweet about it, Like it on Facebook. Add a comment and your own recipes below. If this coffee cake recipe sounds good, you have to see the rest of our dessert recipes. Look here. No Coffee in Coffee Cake? There is no coffee in Streusel Coffee Cake Recipe?? No Tash, a coffee cake got the name from the fact that it was considered a good cake to serve with coffee, not because it contains coffee in the recipe. Most coffee cakes have no coffee in them at all.